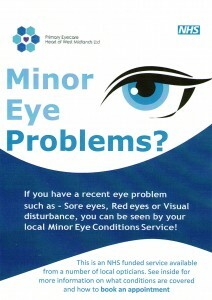 treated by the service, please contact a participating optician who will advise you. Also, if you have a major eye condition that is being regularly monitored by your optometrist or hospital eye service, this will not be covered by this service; for example,cataracts, diabetic retinopathy or glaucoma. For information on participating Opticians and how to book, please click this link eyecare wm for more information.